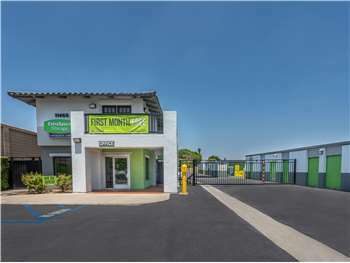 Whittier Self Storage at 11469 Washington Blvd. Located on Washington Blvd. between Gretna Ave. and Broadway, Extra Space Storage serves residents in Whittier, Los Nietos, South Whittier, and Valla. Locals will recognize our facility across the street from Pep Boys Auto Parts & Service and CVS on Washington Blvd. We're also accessible for residents of nearby apartments, such as Duchess Terrace Apartments, Citrus Court Apartments, and Pioneer Gardens. With a large selection of storage units, vehicle storage, and exceptional security, Extra Space Storage on Washington Blvd. is the self storage solution for you in Whittier! Storage units are available in sizes 4x5 to 10x34 at our Washington Blvd. storage facility. Units come with features like first-floor access, drive-up access, and outdoor vehicle parking. Need secure vehicle storage in Whittier? Extra Space Storage offers 8x15 to 10x34 outdoor parking spaces and 8x10 to 15x20 drive-up units that can accommodate cars, motorcycles, boats, and RVs. Just that customer service that Ray provided should be everywhere, I’ll sure recommend Extra Space Storage. Extra Space Storage is for everyday or long term! Price cannot be beat, and when you add onto that the friendly people, locations, and how seamless they make it, its a no brainer. This is our first choice whenever the need arises. If for any circumstance of life you're in need of a storage place look no more they will help you with your need and fair pricing. They have friendly and helpful staff. ExtraSpaceStorage have a very friendly, courteous, and helpful crew providing the best service in a storage company. The online service was very easy to follow without any glitches. My sister had to store all her home furnishings due to an illness. I explained to Melissa that my sister can't sit up very long. Melissa wrote up the contract, then I brought my sister in so she can show her ID & sign the contract. Melissa was professional, patient, understanding and accommodating !!! I got,a 10x10 unit. (Dec.5,2016) The people who,work there,are the best! Melissa,store manager. Drew,up the papers and I clicked,signed,boxes on,computer. To,finish the deal. It,was very easy,answered any,questions. I had. I was moving my,things. To new,storage unit. And I needed,some assistance. So,I called,office. I was in,luck. Reymond, Melissas husband,who also,helps customers in,the office. Was able to, help me, up-right my, safe. It,was heavy on,its side. I needed,a hand. He walked,over less than,10 minutes. And by,himself. Up-righted,my safe. Couldnt,believe it. I offered,a tip and he said,no. Units and halways are clean and staff always very helpful! Longtime satisfied customer! I was going through a really tough time and the managers made my move into storage really easy. The access hours were great for me and my family. The facility is clean and well maintained. Highly recommended!! I THINK THE FAMILY RUNNING THIS COMPANY IS GREAT AND MAKE YOU FEEL LIKE ITS MORE THAN A BUISNESS, LIKE HOME. THE FACILITY HAS GREAT CUSTOMER SERVICE AND THEIR HOURS OF OPERATION FIT THE NEEDS OF THE CUSTOMERS. Hours of the facility are convenient, easy access to my storage And friendly staff!!!! This facility is so we'll kept. I feel my items are very secure. Also, the people who run it are nice to work with. Wonderful customer service. Explained everything very well. Very courteous. Thank You. This is a clean facility, I was recommended by a family member and in-turn just recommended another family member. Melissa is great at managing the facility. I like the drive-up access. They have friendly, welcoming staff. I've had no problems and they are alway available for any question I may have. The facility is always clean and the hallways are always wax. My items are keep save and free from any bugs, spiders or anything else you could think of. I've been with this facility for five years now and have had no problems. This is a great place and I don't see myself ever using anywhere else. I have been storing at this location off and on for a few years. The place is ALWAYS clean. The managers are great. I will recommend this location to anyone who asks! I have had an excellent experience with extra space storage in Whittier, Ca. Melissa is extraordinary! You couldn't have picked a better manager. She is very professional and has great personality. they are always there for us , place is very clean, have no regrets.....thanks! keep up the great work! Location is very clean and very easily accessible. This Facility is conveinantly located, has great customer service and is affordable compared to the other facilities in the area. I am very satisfied with the storage I am currently renting and best of all, has drive up storage. I will definitely recommend to friends and family. Going southbound on the 605- exit at Washington Boulevard - East. Turn right- south- on Pioneer. Turn left- east- on Washington Boulevard. Extra Space Storage is approximately one mile down just after Broadway Ave. on the left side of the street at 11469 Washington Boulevard., across the street from CVS. Going northbound on the 605- exit at Washington Boulevard. Make an immediate right- south- on Pioneer. Turn left- east- on Washington Boulevard. Extra Space Storage is approximately one mile down just after Broadway Ave. on the left side of the street at 11469 Washington Boulevard., across the street from CVS. Take the 60 freeway west to the 605 south. Exit at Washington Boulevard and turn right on Pioneer. Turn left on Washington Boulevard. Extra Space Storage is on the left- just after Broadway. Our address is 11469 Washington Boulevard. Across the street from CVS. Take the 60 freeway east to the 605 south. Exit at Washington Boulevard and turn right on Pioneer. Turn left on Washington Boulevard. Extra Space Storage in on the left- just after Broadway and across the street from CVS. Our address is 11469 Washington Boulevard.